Sometimes we come across that one thing that stops our day, captures our heart and mind. 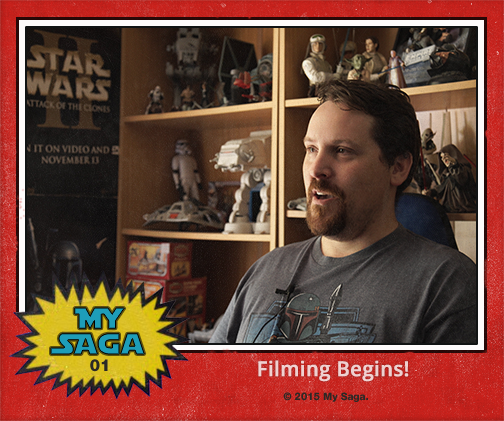 This happened to me just recently when I came across the trailer for “My Saga- A Star Wars Fan Documentary”. In that 2.32 minute trailer I was captivated and on my own Star Wars mission to connect with Adam Harris. who discovered he had a brain tumour four years ago which led him to follow his dreams. We shared some time with him as he continues on his journey, this is his Saga! 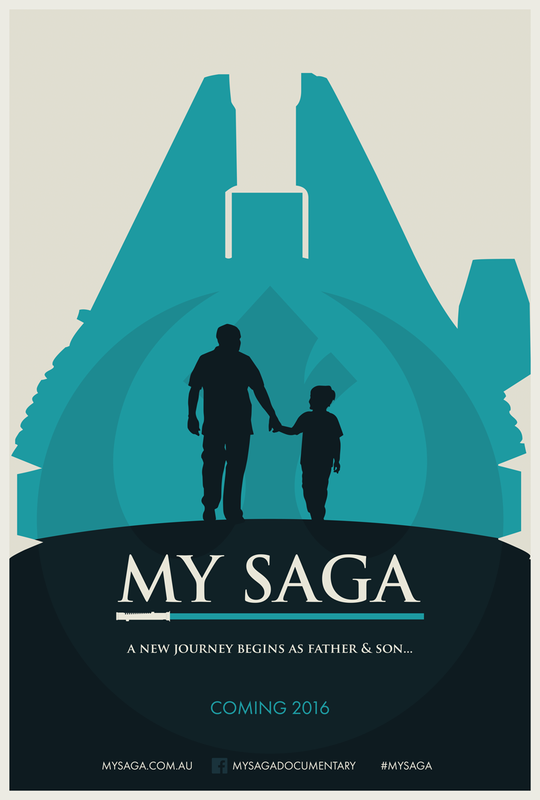 1.The trailer for your upcoming film, My Saga, has just been released, can you tell us more about your journey? The journey to make this film has not been an easy one. It started with a Kickstarter Campaign (crowd-funding) to try and raise enough for our journey to the U.S. to make part of the film. I wanted to take a sort of Star Wars pilgramage of sorts and discover the bonds between generations of Star Wars fans. I wanted to also show the journey of the build up leading up to that pinnacle moment of when myself and my son Jack saw the new film for the first time. So after months of plugging away we got across the line in our crowd-funding and we began filming in February of this year. It’s been a hard slog between working my 40+hr week job, family time and making this film but it has been worth it. 2. Star Wars really is more than “just a movie”, why do you think that is? I think with Star Wars that there are so many things and characters we relate to. For me it was a universe I could escape into and dream about being Luke Skywalker and having his courage to confront those situations I feared in real life. I think ever Star Wars fan has some sort of emotional connection with a character or a situation that happens in these films that they can relate to in real life. 3. Getting the news you received 4 years ago was it Star Wars that gave you the strength to start this journey? It was a bit of it, but a big part of that was my family. Star Wars has always been a strength in my life and I am extremely lucky that my family supported me when I said I wanted to chase my dreams of being a film-maker. That dream all began when I saw Return of the Jedi in 1983, which was my first big screen experience. So Star Wars has always pushed me, but it was that sudden change in my life and the support and love of my family during that time that helped me believe in myself and then i took that leap and now I’m living that dream, and its to do with Star Wars and I get to share that with my son Jack so it’s a win-win in my book. 4. You have recently just embarked on a trip to the U.S. with your son, can tell us more about that? Well with the news of a new film and the announcement of Star Wars Celebration I wanted to take that trip to the U.S. to go on a bit of a Star Wars road trip of sorts. We visited Lucasfilm, unfortunately didn’t make it past the foyer, but was amazing. Visited Rancho Obi-Wan (amazing! I want to live there) and then we made the trip to Anaheim for Star Wars Celebration….but I don’t wish to give too much away…. 5. What were some of the highlights of the trip, the people you met? 6. What do you hope is the one thing people will take away from your documentary?? Chase your dreams, don’t be afraid and roll the dice. It can be hard, and scary but in the end you don’t wish to look back on your life and say you never tried. 7. What do you think it means to be a Star Wars Fan?? Adam Harris is not only just living his dreams, he is reminding us to live. I’m looking forward to following his journey towards the release of his film in 2016.